Israelis wait to board at Ben Gurion International Airport a day after the U.S. Federal Aviation Administration imposed a 24-hour restriction on flights after a Hamas rocket landed within a mile of the airport, in Tel Aviv, July 23, 2014. Israel tried on Wednesday to get U.S. and European commercial flights to Tel Aviv restored after some carriers suspended services, insisting its main airport there was safe despite being targeted by Palestinian rockets. Israeli authorities emphasized the success of the Iron Dome interceptor system in protecting Ben Gurion Airport from rockets fired by militants in the Gaza Strip, as well as a precautionary narrowing of air corridors since fighting erupted on July 8. However, Israel also said foreign airlines could use an alternative airport deep in its southern desert. About 30 foreign airlines have suspended flights to Ben Gurion. Three of them were American, acting in accordance with a Federal Aviation Authority (FAA) ban issued on Tuesday, which was extended by 24 hours on Wednesday. Turkish Airlines also extended suspension of its flights for another 24 hours. The FAA said it was responding to a Palestinian rocket that struck a building two km (one mile) from the airport. Israel said the damage was from debris left by that its Iron Dome system had shot down. “Our airport is safe. Our airport is secure. And we hope the American carriers will be flying to Israel soon,” Mark Regev, a spokesman for Prime Minister Benjamin Netanyahu, said in an interview on MSNBC. However, most European airlines have followed suit, sharply reducing traffic through Ben Gurion, a mid-sized airport that normally bustles during the summer. Israeli officials described the FAA notice as too hasty and affected by international jitters over the shooting down last week of a Malaysian airliner over Ukraine. Giora Romm, director-general of Israel's Civil Aviation Authority, said he spoke with FAA counterparts and gave the agency a host of information on the safety of the airport. Romm dismissed comparisons between the relatively unsophisticated rockets made by Gazan militants and the Russian-built radar-guided missile which the West believes brought down the Malaysia Airlines flight with the loss of 298 lives. The United States is still assessing the capabilities of the Hamas rockets, the U.S. State Department said in a statement. The statement says Hamas does have rockets that can reach Ben Gurion, although their accuracy is limited. Whether Hamas has heat-seeking missiles has not been determined, the statement said. Three civilians have died in Israel in the rocket attacks out of Gaza, including a foreign laborer hit on Wednesday. Some 687 Palestinians, mainly civilians, have been killed in Gaza since Israel launched its offensive to halt the missile salvoes by Hamas and its allies. Thirty-two Israeli troops have also been killed. Netanyahu on Tuesday asked U.S. Secretary of State John Kerry, who is in the region trying to broker a Gaza truce, to help restore U.S. commercial flights to Tel Aviv. But a U.S. official said the Obama administration could not overrule an aviation security precaution. A departure flight board displays various cancelled and delayed flights at Ben Gurion International Airport a day after the U.S. FAA imposed a 24-hour restriction on flights, in Tel Aviv, July 23, 2014. Israeli airlines continued flying and the Tourism Ministry said on Wednesday that 22 foreign carriers were still landing at Ben Gurion, among them British Airways, Iberia and Aeroflot. 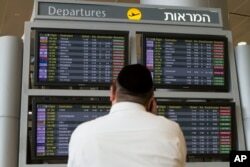 Some 209 flights were to operate at Ben Gurion on Wednesday, with 132,000 arrivals and departures, the ministry said. Among the European airlines that have suspended flights are Germany's Lufthansa and its subsidiaries, including Austrian Airlines and the airline Swiss. The Gaza war is set to wipe at least half a billion dollars off the Israeli economy this year, industry bodies estimate. Flag carrier El Al has picked up some of the slack and used a larger jet than normal on its morning flight from Zurich to accommodate Swiss passengers. Swiss code shares with El Al. El Al also is seeking approval to fly planes to Turkey to bring home an estimated 4,000 Israelis stranded there. Israeli Transportation Minister Yisrael Katz called the FAA decision “out of place” and a “reward to terrorism”. However, he said Ovda Airport, used mostly by military aircraft and situated near the southern resort of Eilat, was ready as an alternative to Ben Gurion. Lying deep in the Negev desert, 152 km (98 miles) from Gaza, Ovda is beyond the proven range of Palestinian rockets. Officials from European carriers said Ovda was too small and remote from Tel Aviv and nearby Jerusalem. State Department spokeswoman Jen Psaki said the FAA was in close touch with Israel and monitoring the situation. She also noted that Kerry arrived in Israel on Wednesday on a military plane that was not bound by the FAA order. Former New York Mayor Michael Bloomberg flew to Israel on Tuesday night on El Al in a show of solidarity. Small cruise ships have also stopped calling at Israel's Ashdod port at the request of port officials.